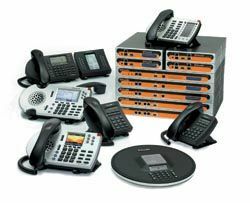 While cost justification remains important when considering any communications IP telephony system purchase-such as the ShoreTel solution pictured above-the issues driving decisions today are based on leveraging network investment, productivity enhancement, mobility, features, ease of programming, applications, and simply buying current technology with a forward-looking bent.ᒠVoice over Internet Protocol (VoIP) is a term with which most systems integrators are now familiar, if not fully comfortable. Reseller sales and customer deployments of networked-based telephone systems are the accepted norm, rather than the exception when compared to legacy digital telephony technology offerings and the trend toward a seamless, fully IP-enabled communications world is moving forward rapidly. The reasons for this acceptance are reality-based. There are millions of small- to medium-sized businesses who need communications systems, and VoIP is a broad-based communications technology platform proven to work and provide real features and functionality benefits unavailable with previous communications technologies. Take Teleworking as an example. Having a softphone on your computer or an actual system phone instrument at home that you can directly attach to an internet connection and then be fully a part of one's business telephone system with indicators, buttons, voice mail-just like on your office phone-is a real productivity enhancer, brought to fruition via VoIP technologies. So what is important about VoIP today? What do systems integrators (and their customers) have to think about when vetting a solution? Is it ROI? Yes, money spent must almost always be justified. Is it network readiness? Yes again, as VoIP is a service that resides on a network and having a properly prepared network (and a staff that can manage it) are important elements. These are the obvious questions, but there is a new nuance or what I refer to as a "Finer Intelligence" in determining the value and efficacy of a specific VoIP solution, particularly when determining which manufacturer is the right one to bring on board. Multitudes of telephony manufacturers are in the VoIP game. Some are brand names like Cisco, Mitel, and Avaya, whose logos you see on the desktops of fortune 500 companies, movie sets, and TV shows. Others are start-ups or phoenixes rising from the ashes of failed traditional telecom equipment manufacturing. Some are basically garage-based tinkers. Some are huge in computer or network technology arenas and are now entering communications. All of them know how to market their wares and make pretty brochures, while authoring white papers on what makes VoIP tick. Divining the right choice for your company as a reseller and for your customers is where the finer intelligence part comes into play. Even before considering what a VoIP manufacturer does with its technology, it's wise to consider the company and its ability to last in a crowded and highly competitive marketplace. This leads to looking at a company's balance sheet, leadership, and prospects for the future. No system would be worth any price if all of a sudden the company folded or left the "space". This analysis is not just looking at bulk and net worth, but also at the company's wherewithal to sustain and grow its commitment to the market. A smaller, well funded company with experienced, stable, and committed leadership and great technology insight might be better than a multi-national behemoth that may decide to turn its vision and resources elsewhere. Or the converse may be true. You just need to look deeply and ask tough questions that require backup, not just promises. One way to do this is to request a "10-Year Comfort Letter" in writing from the manufacturer's CEO, confirming that they will support the specific technology for that period of time. Phones are not like computers. Customers expect a telephony investment to last for a much longer period of time, and having demonstrable comfort builds trust in a company's integrity. Of growing concern in VoIP is system security. Many people think that most packet switched phone systems can't be hacked or eavesdropped as readily as traditional telephones, especially when fiber optics are employed. The reality is that older digital phone circuits are typically harder to tap into than IP packets carrying voice, because older digital-based telephone data streams are specifically arcane and unique to a given manufacturer, making it harder for intruders to know what to look for. In IP phones that lack robust data encryption when moving voice packets across a network, a savvy IT individual can easily capture and decode the voice data, even by tapping into a network fiber link. Here's an example. A desktop of one major manufacturer of VoIP gear was recently hacked, in which the conversation audio from the telephone set was remotely and surreptitiously set up to stream as a broadcast across the network to a listening IP address. If that isn't phone-tapping, then the definition is wrong. Other manufacturers have inherent deep encryption, such as the 128-bit Advanced Encryption Standard (AES), to keep the bad guys out. Device security authentication on the network is also burgeoning with many larger customers and having support for authentication protocols such as IEE 802.11x is important to confirm within a prospective product. More mundane, but real nonetheless, is the use of embedded web servers in systems to provide simple web-like pages for access to system and features programming. If a hacker gains network access and finds the IP address of the system programming server, there is a chance for wreaking havoc, as many systems' HTML-based programming forms are protected only by simple passwords. While overall network security is key to success in the homogeneous world of VoIP, the inherent security capabilities of the VoIP system themselves are issues to explore. Once again, don't accept pat answers or dismissal of the issues, ask for back up and actual demonstrations of vulnerability avoidance. Does it play well with others? Interoperability with other systems and manufacturers has been a vague promise of the IP phone revolution since Vocaltec released what was arguably the first internet phone software back in the mid 1990s. "Voice will ride for free on the network," was the battle cry of early pundits (I was not one of them-I know there is always a bulldog to feed). Today, interoperability, at least at the phone instrument level, is limited to the burgeoning Session Initiated Protocol (SIP) based devices. Even with SIP, you have to confirm that all of the features you may need are supported; many are not, being reserved for the proprietary instruments and devices connected to the system. While waiting for the phone fairy to come and make all calling free, you can look at more meaningful and real interoperability within a system's design. This friendship can come in the form of using industry standards to support other applications and functions not directly provided by the telephony manufacturer. Examples are Link Layer Discovery Protocol - Media Endpoint Discovery (LLDP-MED) which allows a data switch to intelligently know the capabilities of connected devices, and application integration to desktop software or enterprise servers such as Microsoft's Live Communications Server or Office Communications Server. The above examples cover a VoIP device's relationship with a data switch and a relationship with the 800-pound software gorilla that lives in most businesses. Keep in mind that there are wars going on behind the scenes between different technology sectors and providers in an effort to dominate the total communications experience, and the manufacturers will spin their positions ruthlessly. Ensuring that your VoIP choice plays well with others is important if you want maximum flexibility to keep customers happy in the long run. The real value of VoIP is not the technology, but what you can do with it. This is where the lines start to blur between voice transport and myriad of existing and blossoming software applications. This is also where the real sales battles will be won or lost, as VoIP fully reveals its core mystery and becomes what it really is-simply a way to put voice and control on a network and within applications. Cut away all the curb appeal of convergence, and VoIP itself is quite pedestrian. So where is the promise of VoIP? It is in the seamless integration of voice (and system control) with other applications, processes, and devices, all to simplify and add value through the leverage of the appliances we hold to our ears or tap with our fingers everyday. Launch a videoconference from your phone? Yes. Become "present" at any endpoint you desire, whether it is a cell phone, a desktop phone, a computer, or wireless device, all through one number? Yes. Break down the silos of email, voice mail, and desktop software? All yes.